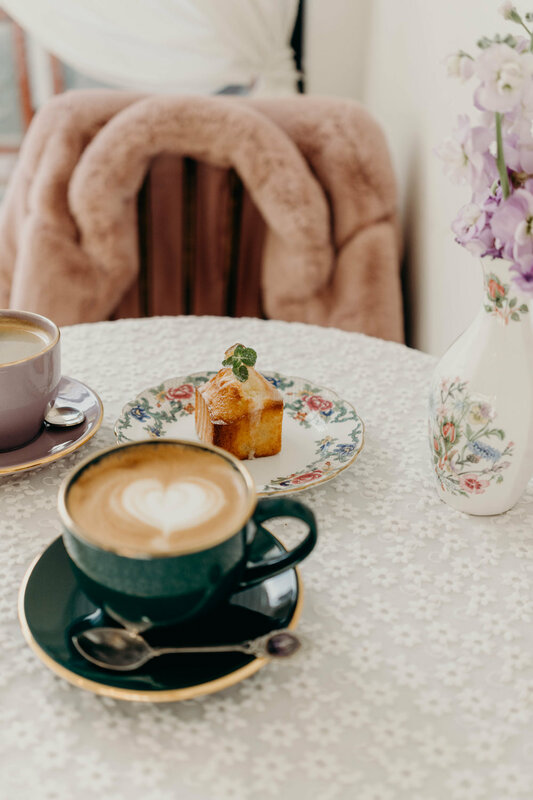 If you do a quick Google search, you’ll find plenty of lists of must-visit, #doitforthegram cafes (Zapangi or Style Nanda Pink Pool Cafe, anyone? ), and plenty of quirky concept ones as well (cat, dog, sheep, raccoon, meerkat, or even poop), but more often than not, those lists are comprised of the same few cafes, ‘hot spots’ where you order something more for the way it looks than the way it tastes, and then random ones that were in the general areas the expat or visitor lived or stayed in and visited once. I wanted to put together a short list of still Instagram-worthy cafes not on the usual lists for the slow travelers, who explore cities by wandering aimlessly, getting lost, and appreciating beauty they find in random pockets, who’d rather spend a morning watching the sunlight shift in a quiet cafe than tick a handful of places off a list that said they needed to visit. The best part of these cafes is not even that the food and drinks taste good, and happen to look good, too, but that the service is good, and that the owners and servers care more about the quality of your experience than how quickly you place and receive your order. 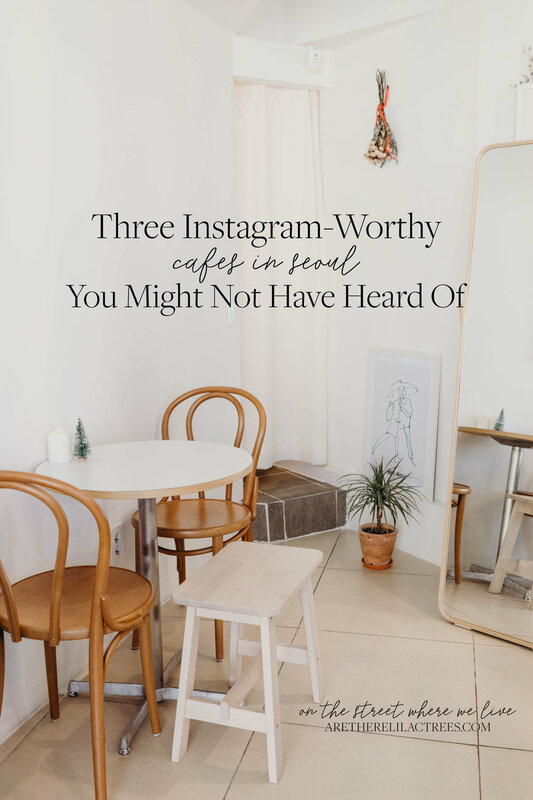 Three Instagram-worthy cafes in Seoul you might not have heard of, but will want to return to. Take the Line 4 to Sookmyung Women’s University (숙대입구역), then take the town bus, Yongsan 02 (마을 용산02), at the Exit 5 bus stop (숙대역5번출구 정류장 03565) nine stops to Sinheung Church bus stop (신흥교회앞 정류장 03586), which happens to be at the doorstep of Cafe Glad You Came! They do a truly exemplary job of posting real-time updates on their Instagram account (holidays, closings, tart availability), so make sure to follow along before planning a visit! We arrived at Cafe Glad You Came just as the owner was opening shop (actually unlocking the door) and had the space to ourselves for a good twenty minutes or so, just enough time for me to snap photos of every nook and cranny. It’s a small space with limited seating, in an increasingly popular area (Haebangchon, or 해방촌) but a bit off the beaten path, so plan with those points in mind. 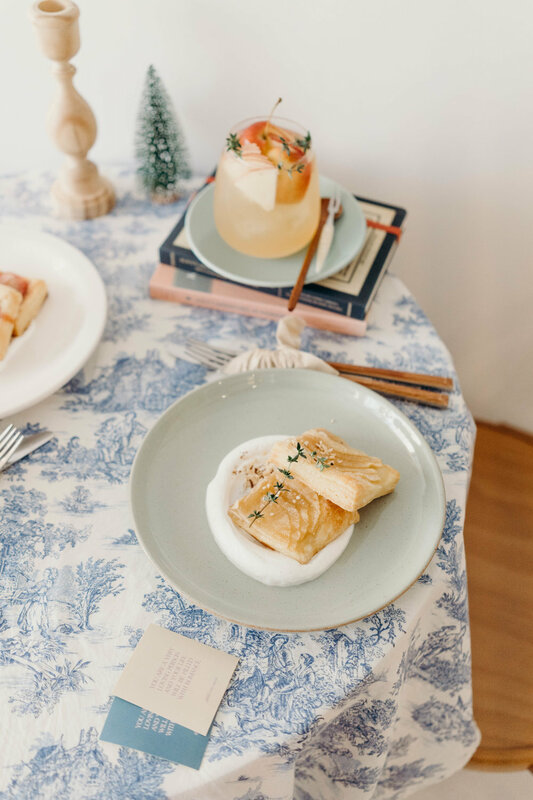 Every detail of the space was clearly carefully thought out, and they focus on making one thing and making it good—tarts! The owner offered to cut us half a piece of both the apple and strawberry, but we ordered a whole one of each (and recommend you do the same). Served on top of whipped cream, the apple is for the sweet tooth and the strawberry for the tart lover. You can place orders for take-out or multiple tarts. The drink is an Apple Ade (Andrew’s was an Americano). Ades are popular sparkling fruit drinks in South Korea, but not all ades are created equal. This one tasted as natural and fresh as it looked pretty. And miniature apples? Come on. Did I mention the service is good? Whereas most places in Seoul are about efficiency (see: 1, 2), Cafe Glad You Came is about quality and #slowliving. And when the owner asks what you thought of the tarts, he sincerely wants to know. Bold statement, but Green Melrose might be the prettiest cafe in Seoul. 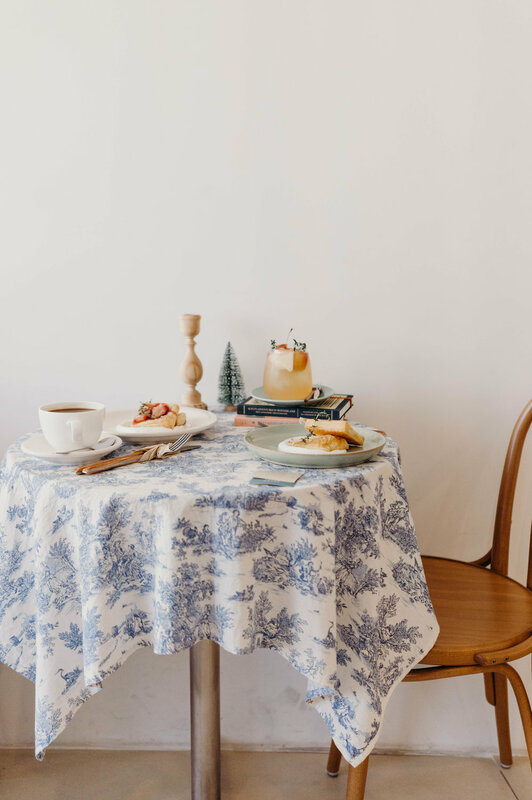 It makes sense that the cafe is so artistically decorated—from the placement of the mismatched furniture, to the twinkling light fixtures, curtains and tablecloths, frames, and other pieces—considering how artistically inclined its two female owners are (see: 1, 2). They have the prettiest assortment of teacups, saucers, dishware, and flatware that they use to serve their pretty (and delicious) cakes and drinks (we ordered lemon cake with a Cafe Latte for me and an Americano for Andrew), and vases with bunches of fresh flowers, so you never quite know what your table setting will look like when you visit. We had the perfect morning here, again with the place mostly to ourselves most of the time, with others trickling in only as we were getting up to leave. 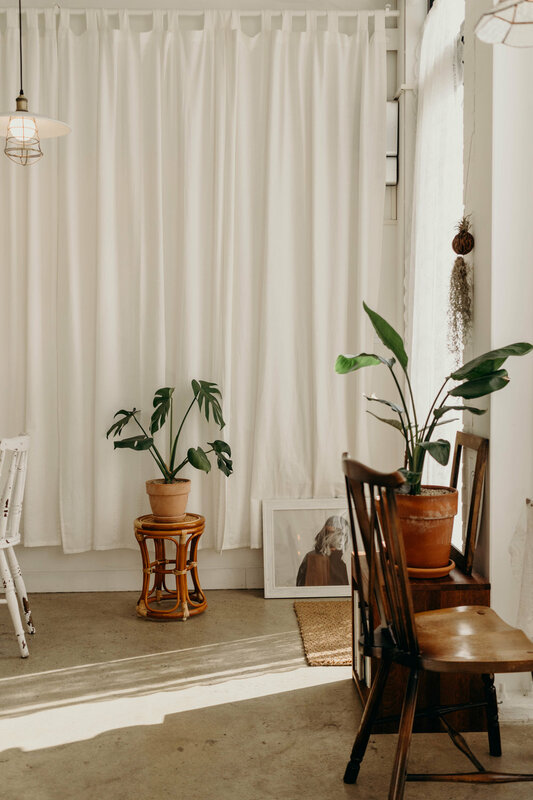 This space gets the most wonderful sunlight, so if you’re a photographer who loves #chasinglight, Green Melrose would be a must on your Seoul cafe list. I’ll be writing a post entirely dedicated to our morning at this cafe, as well as one on the up-and-coming neighborhood it’s in, Yeonnam-dong, inspired by this cafe, so stay tuned! Take the Line 2 to Hongik University (홍대입구역), then take the town bus, Mapo 05 (마포05), at the Exit 2 bus stop (홍대입구역 정류장 14498) six stops to 에덴지우아파트 정류장 (14576), where Cafe Yeonnam-dong 223-14 is just a minute down the road, or take the Line 6 to Hapjeong Station (합정역), then take (blue) bus 761 at the Exit 7 bus stop (합정역 정류장 14011) four stops to 연희104고지앞.구성산회관 정류장 (13111) and follow the underpass to Yeonnam-dong. *Editor’s note: We previously mentioned that the ‘first’ location was Cafe Yeonnam-dong 239-20. That location has since closed, and Cafe Yeonnam-dong 223-14 is now the only location. 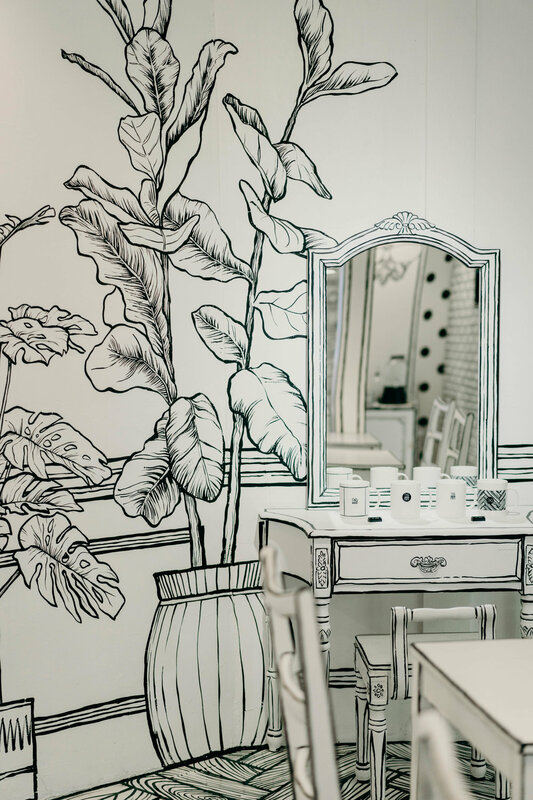 It’s Seoul’s 그림 or painting cafe—everything is painted in such a way that the space feels like an optical illusion and that you can pretend to star in your own cartoon. There’s even a painted rooftop, that the sweet server kindly pointed out to us at the end, with a small hut, a bench, and a clothesline hung over more painted tables and chairs, a perfect place to have drinks in the spring or summertime. 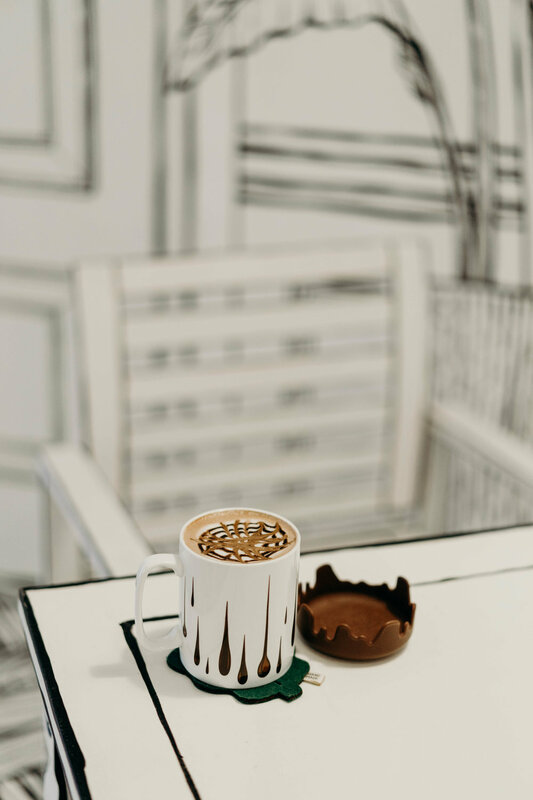 Even the drinks come out on a cartoonish tray and in cartoonish mugs with tops that look like melting chocolate. I ordered the drink pictured left, a Choco Choco Latte, and Andrew ordered an Americano. If you’re noticing a pattern in Andrew’s drink orders, it’s because drip coffee isn’t so much a thing in South Korea. Most cafes in Seoul have an overwhelming selection of drinks to choose from, but if you want drip coffee, you’ll have to search specifically for it (or stop by a Starbucks, which is just silly) and wait a few extra minutes and pay a few extra bucks.